Do tasty and so simple to make. 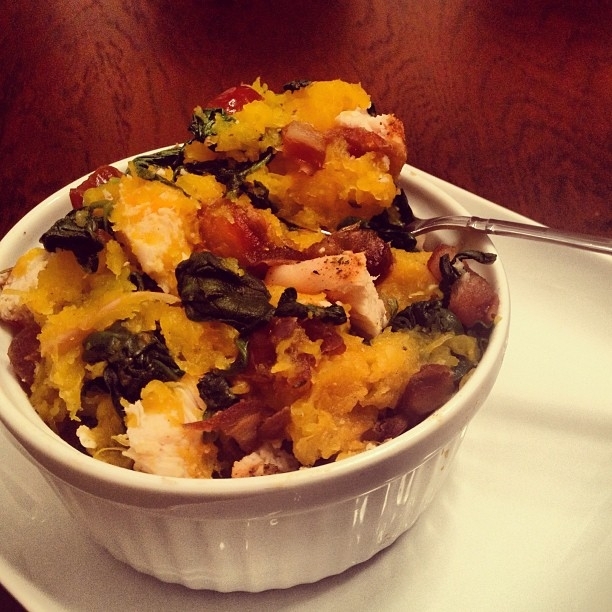 Saw a pinterest recipe for a squash mash, simplified and cleaned up, and this is what I came up with! Perfect serving size for 2, and a savory dinner! Cut squash and half, gut, and sprinkle with sea salt, then bake on 400 for 40-50 minutes. Bake chicken (season to taste), cut into small squares. SautÃ© spinach with chopped dates. Take squash from skin and mash, then mix together with cardamom and other ingredients. Put into two bowls and enjoy!